At Studio Eagle, we practice what we preach to our clients. We’ve built a close-knit culture of collaboration and curiosity that inspires everything we do. 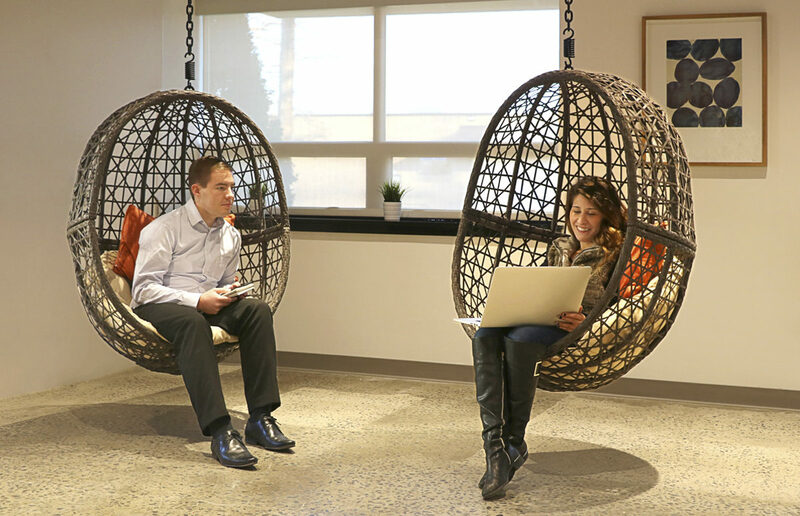 We’re on a mission to create business success for our clients by redefining the workplace. That work begins right here in our office, where we’ve built a close-knit culture of collaboration and curiosity. Professional. It almost goes without saying: We’re timely, honest, and responsive. Always. Upfront. We’re not afraid to challenge ideas and mindsets to arrive at the best idea — even if it’s not the first. Reliable. We do what we say we’ll do, every time. Curious. There’s always more to learn, and that inspires us every day. Entrepreneurial. We grow by pushing ourselves both in our projects and in our careers. Fun. Work-life balance yields better design. We take the time to enjoy ourselves inside the office and out. Just like the spaces we create for our clients, our studio is designed to produce the very best work. In 2017, we moved into a brand new workplace that reflects who we are: design-led, collaborative, and fun. The more communication, the better. We stand (and sit) by those words at Studio Eagle. Our floor plan groups employees into teams, not departments. That means interior designers, architects, and technical teams are constantly talking and collaborating to create the very best solutions. We’re lucky to spend our days designing collaborative workplaces for amazing clients. Not every day is easy, though. When things get tough, we come together as a team, supporting one another and looking for the lessons learned in every problem we solve. Design is at our core, but we also take time to kick back and have fun. From holiday potlucks to mini golf, it’s important to us to celebrate the people on our team and the places we create. Join our team to start redefining the workplace — and your career.